The Kapuas River is with 1143 kilometres length the biggest river of Indonesia and accommodates more than 300 fish species. Particularly interesting here are some monotypical types like Eirmotus or Ellopostoma as well as many endemic kinds, for example Parosphromenus anjuganensis, Pectenocypris balaena or Parakysis anomalopteryx. The other preparations concerned baggage and equipment, particularly the catch material as well as flights, inoculations and a lot more. We decided to go by two people only because small groups are far more flexible than bigger. Unfortunately, we got before the beginning of the journey negative information, like the world-political position by the attempts on the USA which promised nothing really property. In West-Kalimantan the disturbances between the original population of the Dayaks and the settled people from Madura were luckily finished. However on the homepage of the Foreign Ministry of Germany was told that there would be many refugees of the Madura people in Pontianak, the city at the estuary of the Kapuas River, our starting-point. So they could not recommend a journey to this city. Because we arrived from Kuching, we decided to get out there when we would have heard news of disturbances in Pontianak. From Kuching that belongs to Malaysia we could look for some fishes in the region of Sarawak. Sitting in the airplane my fellow Rudi Moeschke told me that he had forgotten his money and the traveller's cheques. Nice beginning. Also our arrival in Pontianak did not serve to improve our mood after the flight which belonged 25 hours. The air smelled of two-stroke-cycle engine gas and it was raining. Before we had selected a sort of pension, called Wisma out of our travel guide where we wanted to go first. From there we decided to do some one-day excursions in the closer region. Unfortunately it took three days to find a guide. The guide we first tried to contact could not be spared at work. So he did send his cousin. We had a vehicle suitable for our purposes a day later. First we wanted to visit the well known place between the cities of Anjugan and Sungei Penjuh at the street from Pontianak direction Sintang behind Mandor. Already Roberts (1989) and many members of the IGL (German Labyrinthfish Association) had mentioned this discovery place. For the Labyrinthfish people particularly the species of Parosphromenus anjuganensis and P. ornaticauda as well as Betta rutilans were interesting. On the bases of the coordinates we took by a GPS, we could find the our place of interest immediately. Here we would have stopped anyway even without these coordinates because of the beauty. 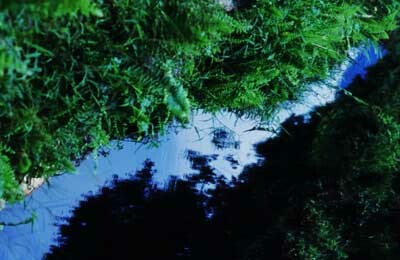 A man made canal was floating parallel to the street and crossed by a picturesque small forested stream. We were still near to the coast. It was the place of the first description of Betta rutilans and Parosphromenus anjuganensis, next to the place of the first description of P. ornaticauda, 53 kilometres by car from Pontianak in the lowlands, called Sungei Kepayang. Up to one kilometre pineapple fields hemmed the street, here was overgrown civilized country. From the primary forest which still stood here till some years, we did find only a few traces. Some bigger trees stood at the course of the river, but most of the trees were still relatively young. 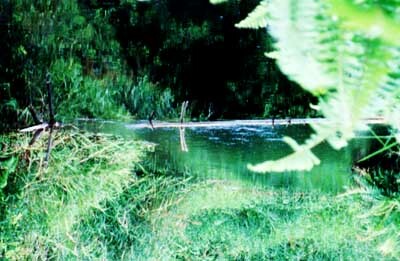 The bank dropped steeply and was relatively rich in structure by plants which hung into the water. The moderately to fast floating water was very clear and looked brown to black tinted, like coffee. 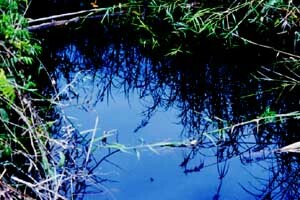 The small stream was 1,20 meters deep and between 6 and 10 meters wide. Everywhere in the water we found wood storages as well as bamboo and bulrushes which were growing over the surface of the water. Furthermore a lot of bulrushes where alga spread out between. Here trees were still cutted in the hinterland and brought by man on small ways up to street. Partly the wood was also stored in the water. On 28/09/01 we could measure at 4.00 o'clock p.m. the air temperature with 28 °C and the following water values: water temperature 26 °C with a pH factor of 4,11 and 33 µ s/ccm³. Our catch equipment consisted several push nets, with and without a handle and a four meters long dip net. As means of transport we used high tubs which are normally used as a water-reservoir for washing as well as plastic bags for fish transport. First we tried to catch the fish by a push net with a handle from out of the water in the man made canal. Here we could catch Rasbora pauciperforata with a beautiful dark red longitudinal stripe next to Rasbora dorsiocellata which had a russet body colour and our first Licorice Gourami, Parosphromenus anjuganensis as well as a female of Betta rutilans. Unfortunately, in spite of intense efforts also during other days, it remained with this single female. 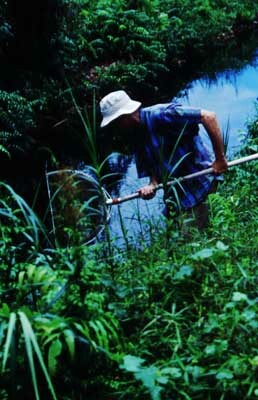 In the small forested river we could already catch a lot of species, Robert's (1989) did catch before in 1976: Rasbora dorsiocellata, R. pauciperforata and R. agilis, Osteochilus spilurus, Puntius rhomboocellatus, Sundadanio axelrodi found in the green variant, Neohomaloptera johorensis, Kryptopterus macrocephalus, Hemirhamphodon poponognathus, Betta cf. taeniata, Parosphromenus anjuganensis, P. ornaticauda, Belontia hasselti and Sphaerichthys osphromenoides osphromenoides. 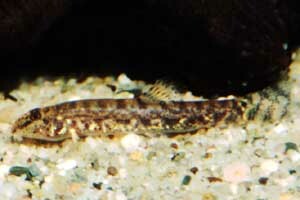 Only the goby Roberts (1989) caught, Stigmatogobius brocki we could not find. But there were some other species he has not caught like Luciocephalus pulcher, a not identified snakehead and a small loach which we decided to take with us because of their beautiful colouration and the interesting examination. It could be Kottelatlimia pristes or a related species. They were found in the slowly floating water in the mud between leaves. There we also caught a few species of Parosphromenus ornaticauda which Roberts (1989) thought it is P. parvulus. P. anjuganensis identified by Roberts (1989) as P. deissneri lived rather in the overhanging grass on the bank catch. In faster flowing areas Neohomaloptera johorensis were be found which inspired us on account of their low size, the orange colour in the tailfin and the two red coloured maxillary barbels on each side. Also from this kind we did bring some specimen to Germany. We could catch the beautiful Sundadanio axelrodi only with the dip net in the weakly flowing free water an sometimes in unique specimens by push net in the flat water at the bank. With one draught we did get up to 150 specimen of this kind. Besides we caught also some Puntius rhomboocellatus, Rasbora agilis and Sphaerichthys osphromenoides. 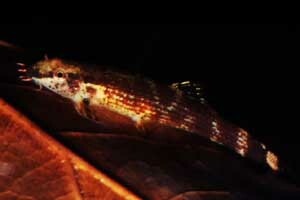 Luciocephalus and Channa stood in the flat water in the bank area, we caught Belontia in the ditch in bank nearness. Because we struck out with our white bodies and the partly rather peculiar clothes, like surf shoes or tropical hat our nice and helpful guide Kasigen had a good time. A lot of people which liked to know what the funny Europeans were doing in this river, stopped their car and talked to Kasigen, because we did not understand their language. They often had a good laugh. One day there were two fishermen who catched regularly Sundadanio for the export and reported us that approx. 4 months ago already a Japanese girl had caught here and in other rivers a lot of fish. Because of the high number of interesting fish species not farther astonishing.